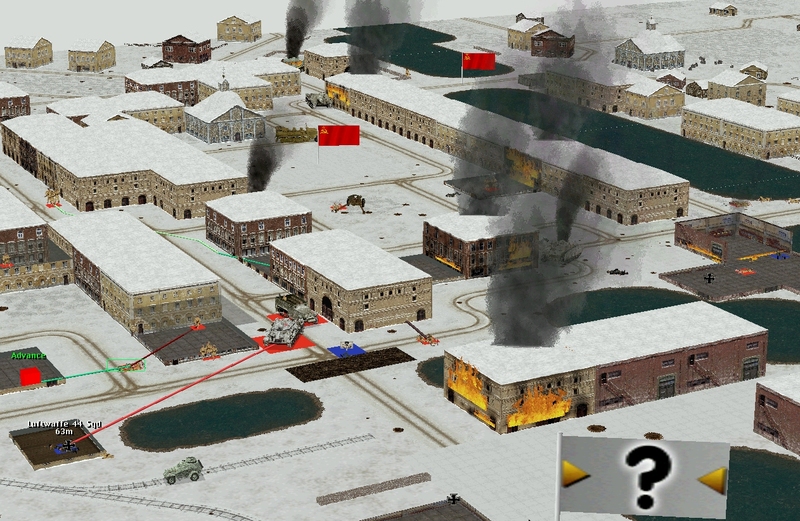 The third communal Combat Mission skirmish – a comment-driven confrontation between RPS readers and Combat Mission: Barbarossa to Berlin’s uncommonly entertaining AI – has four turns left to run. 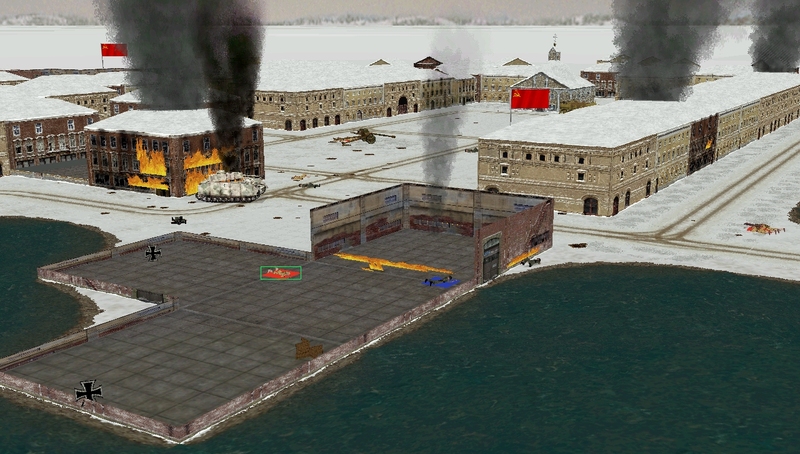 By Monday the commenter-controlled Soviets will either be celebrating the eleventh-hour capture of New and Old Wharf (the most valuable Victory Locations on the map) or fielding difficult questions from their superiors. Neither of the two remaining Soviet AFVs received orders yesterday but Tim and tide wait for no man. In a parallel universe somewhere, the unhorsed BA-64B driver kicks open the door of the house at j12 and proceeds to eliminate eight heavily armed Luftwaffe infantrymen using nothing but a Tokarev pistol and a scavenged chair leg. In our universe he’s riddled by a Schmeisser moments after entering. Revenge isn’t slow in coming, however. As the LW squad exit the building, perhaps intending to join their pals at l9, they draw fire from Renko and elements of Myshkov’s platoon. The bullets are followed by a devastating swarm of canister shot that leaves four hideously mangled corpses in the roadway. Meanwhile, up north, the AT team is playing Keystone Cops. As they dash through the front entrance of the station, their quarry, the StuH crew, make a swift exit through the back entrance. Remember the German riflemen that defended the house at p15 so tenaciously? Choking smoke and spreading flames finally persuade them to relocate at T+24. The two singed survivors are sprinting south when rifle shots from the windows of p18 end their war. Mars seems to be taunting Ryumin’s 1 Squad. Sent onto West Bridge, a VL strewn with the corpses of their comrades, for the umpteenth time, the fragile six-man scout team doubles back after coming under SMG fire from the riverside warehouse. Lapshin’s 3 Squad could help them out but doesn’t. They entered the warehouse last turn but are too nervous to expand their footprint at the moment. Lapshin’s 1 Squad reach the barricaded wharf entrance midway through the turn. Soon mortar bombs are detonating all around them. At T+52 a sliver of shrapnel bodkins an SSh-40 helmet and 1 Squad finds itself down to eight men. ^ (Click to enlarge) Lapshin’s 1 Squad is ‘shaken’ and seeking cover. Flare Path is scourging the LW squad at j12. Both of Myshkov’s closest squads are exhausted. The third is still some distance from its n16 destination. ^ (Click to enlarge) The three Soviet riflemen in the riverside warehouse (Lapshin’s 3 Squad. 1 x SVT rifle, 1 x Mosin-Nagant rifle, 1 x DPM LMG) are out-of-command and ‘shaken’. So is Ryumin’s 1 Squad, the unit sent back to West Bridge. Grey ‘?’ flags fly over Castle, Old Wharf, New Wharf, and West Bridge.